That’s not what I wanted to hear Adam Wainwright say. That’s not how this St. Louis celebration was supposed to end. But first, there were some good things that happened at Busch. Lots of them, actually. It was Opening Day — the biggest St. Louis holiday of the year! It was big, it was inspiring. Sure, it was a little wetter than planned, but that never stops Cardinals fans from reveling in the excellence of the past and the present. Despite a 90 minute delay and conditions that kept the iconic Clydesdales from entering the stadium, the celebration kicked off in Hall of Fame fashion. Lou Brock, Bob Gibson, Red Schoendienst, Ozzie Smith, Bruce Sutter, Whitey Herzog and, of course, the greatest Cardinal of them all, Stan “the Man” Musial paraded in, then were introduced as they took their places around home plate. 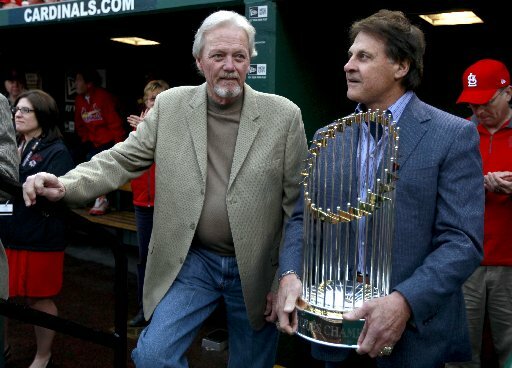 The last four World Series trophies were brought in by members of the winning teams, the 2012 Cardinals were introduced, the 2011 team was honored and the championship banner was raised. The pomp and circumstance is largely for the fans. But don’t think the uniquness of Opening Day in a Cardinals’ uniform is lost on the players. Especially after the October they shared. If you missed the ceremony coverage, check out the play-by-play from Derrik Goold here. The ovations for returning players like Schumaker, Lance Berkman and especially David Freese were reminiscent of those October nights, the support and appreciation from the fans almost palpable … even through a television screen! And with Adam Wainwright making his triumphant return to the pitching mound after more than a year away, recovering from Tommy John’s surgery, the roar only grew. And that’s where the momentum hit a wall. You know, it’s kind of like when your best friend goes to see a new movie before you do, then tells you it’s the most amazing movie ever made over and over and over. You expect it to blow your mind, and then, well, it doesn’t. Yeah. It was kind of like that. Look, coming back from Tommy John’s is hard enough. But to do it with Cy Young level expectations, in front of an adoring crowd, with an insatiable desire to live up to the moment, after a significant rain delay and on-field celebration, in unfortunately cold, wet weather is even harder. Even for the best. The game started with a ground-rule double by David DeJesus, and things didn’t get much better from there for Waino. Back-to-back singles scored the first run, a three run homer made it 4-0 Cubs. The second inning was a breeze, but with his velocity strikingly low, it still wasn’t looking good. The third inning did Wainwright in. Ground out, walk, single, walk. Then Bryan LaHair smashed the first pitch he saw for a grand slam. Wainwright would finish the inning, but for only the second time in his career, he surrendered eight earned runs. And, for the second time in his career, he didn’t make it past the third inning. Nope. Not his day. And this was a tough one to stomach after hearing how “ecstatic” he was for the Opening Day start. Okay. Now that that’s over with, we can look at the few things that did go right in the game. The guys played a very solid seven innings. Without the first and third innings, the Cards only gave up one run on three hits — most of that being covered by the bullpen. The Cardinals out-hit the Cubs 12-10, scoring five runs in the fifth inning as they attempted to come from behind. Both Matt Carpenter and Carlos Beltran were 2-for-4, and Jon Jay was 3-for-4. Rafael Furcal was the only position player without a hit. Unfortunately, they were just 4-for-11 with runners in scoring position, stranding eight on the day. Defensively, they turned two double plays, backing the bullpen of Victor Marte, J.C. Romero, Kyle McClellan (who pitched two scoreless innings with three strikeouts) and Fernando Salas. No, it wasn’t the resounding victory the 46,882 fans in attendance had expected to cap of the day. No, it wasn’t fun watching our ace (especially in the absence of Chris Carpenter) get beat up. Yes, it would have been nice to take advantage of Chicago’s weak bullpen and pull off the comeback win. But, it’s one game. One to learn from, and then put out of their minds. Tomorrow, they get their World Series rings. Then, all eyes turn solely to 2012. This entry was posted in 2012 Season by Tara Wellman. Bookmark the permalink.